St. Louis Gay Pride takes place the last weekend in June—the dates for this year are June 29 and 30, 2019. This celebration includes PrideFest and its famous Pride Parade, plus a number of other events. Over the weekend, St. Louis, which is one of the Midwest's largest cities, draws significant numbers of LGBTQ folks and friends from throughout eastern Missouri, southwestern Illinois, and other neighboring states in the Mississippi River region. PrideFest and the Pride Parade are free, but a $5 donation is strongly suggested. St. Louis Gay Pride has been a formal celebration since 1980, when hundreds of people gathered to march in The Lesbians and Gays Walk for Charity, organized by what was then called the Magnolia Committee—today it's known as the St. Louis Lesbian & Gay Pride Celebration Committee. Because the event was so popular, city representatives decided to hold an annual PrideFest in June, in honor of the Stonewall Riots of 1969. Today, more than 300,000 people attend PrideFest, one of the biggest celebrations during Pride weekend, and every year, that number increases. The festival includes a food court, kids and family area, dance pavilion, and a main stage featuring a slate of terrific performers. Details will be added as information becomes available; previous performers include Jordin Sparks, Laura Bell Bundy, Jessica Sanchez, Kat Deluna, Alisan Porter, Runaground, Blu Cantrell, Zach Noe Towers, Peggy Sinnott, Todd Maseterson, the Gateway Gay Men's Chorus, Kim Massie, and many others. 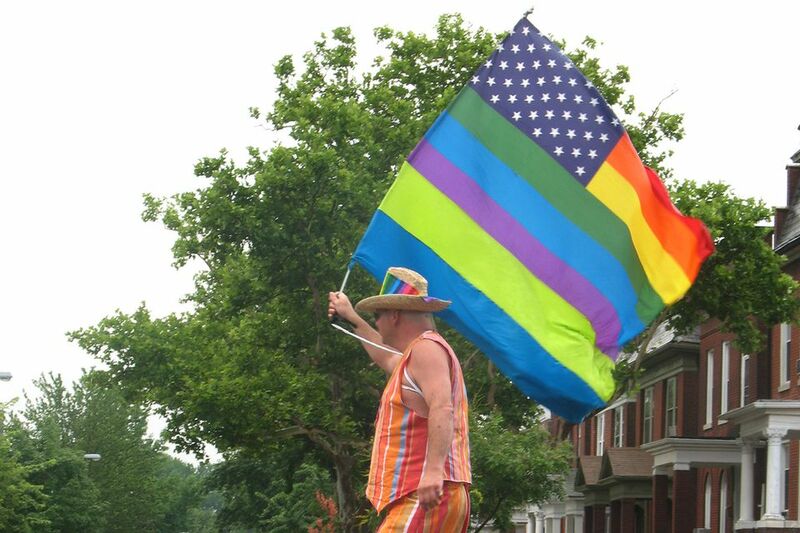 The city's St. Louis Gay Pride Parade is held the last Sunday of June at noon and lasts about two hours. The parade runs along the Gateway Mall, beginning at 8th and Market Streets, and continuing along Market west to 18th Street. The Arch serves as the backdrop and main focal point to the parade. PrideFest is hosted in Downtown St. Louis at Soldiers' Memorial. This central location means the celebration is easily accessible by public transit such as MetroLink and MetroBus. You can also find a taxi stand at the corner of 14th and Market. Street parking is also available, and the meters are free on Sundays. Check local gay resources, such as Vital Voice gay newspaper, the St. Louis-focused Boom.LGBT website, and the local LGBT Outrage Magazine, for details about the local scene. Also take a look at the excellent GLBT site produced by the city's official tourism organization, the St. Louis Convention & Visitors Bureau.